The donation of Ashlyn Dyer's organs gave the gift of life to many. 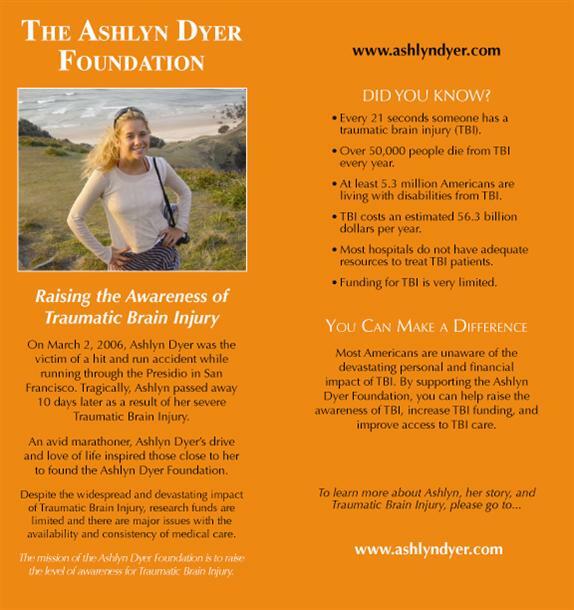 In this same spirit, The Ashlyn Dyer Foundation for Neurological Research and Support has been created to honor her memory by making a positive impact for other affected with Traumatic Brain Injury. Injury to the brain or spinal cord affects nearly 2 million people in the United States each year, causing permanent functional disabilities including paraplegia, quadriplegia, and cognitive disorders. Every 15 seconds someone receives a head injury, and every five minutes one of these people will die. Survivors of severe brain injury typically face five to ten years of intensive services. The cumulative mean cost of this care is currently 4 million dollars per patient. Note: The foundation is no longer with the Marin Community foundation.